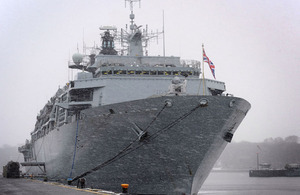 The Royal Navy's flagship HMS Bulwark has paid an unexpected visit to the home of the German Navy after winter weather thwarted efforts to visit the country's greatest port. Ice on the River Elbe meant that HMS Bulwark could not sail into Hamburg as planned at the beginning of her winter mini-deployment (which was a diappointment to the people of Hamburg apparently as the city’s principal newspaper, the Abendblatt, was very keen to see the assault ship). Indeed, the cold snap dominating northern Europe meant few of Germany’s ports were open - but Kiel was, so Bulwark passed through the Kiel Canal linking the North Sea with the Baltic and made landfall in the home of the Deutsche Marine (German Navy). Bulwark’s surprise visit excited the local media - who promptly dubbed her the Eis-Fluchtling (ice refugee) and celebrated the appearance of ‘a behemoth in Tirpitz Harbour’. 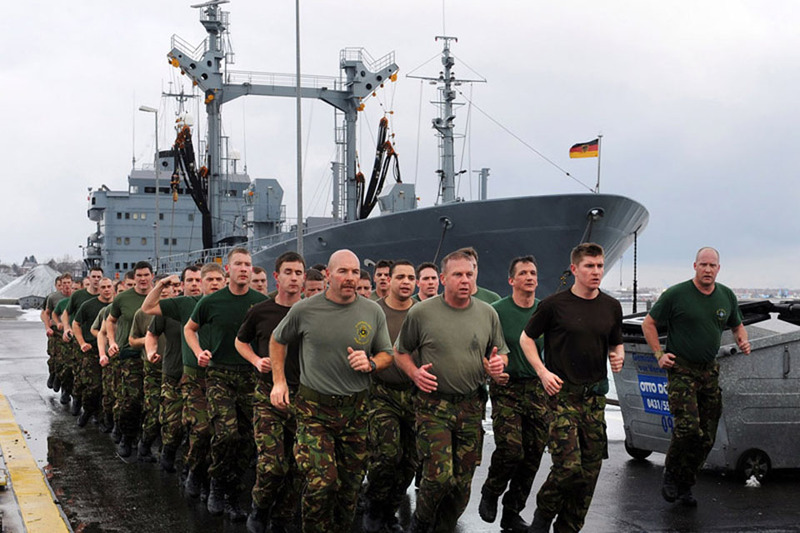 It was a balmy zero degrees Celsius in the snow-covered Baltic port - enough to make the waters passable for the Devonport-based warship and to encourage her Royal Marines Commandos to go for a run around the city in T-shirts (more sensible members of the ship’s company donned warmer attire for their keep fit sessions). Bulwark has spent the past few days at the naval base and the unscheduled visit to Kiel gave the ship’s company the chance to pay their respects to their forebears. The Kiel Nordfriedhof Commonwealth War Graves Commission cemetery is the last resting place of 983 British personnel who were killed in the Second World War. The dead are mostly from RAF bombing raids - as one of the Third Reich’s principal naval bases Kiel was subjected to ferocious attacks which levelled much of the city. In addition to fallen airmen, however, there are numerous naval personnel laid to rest there, not least many of the 127 souls lost when destroyer HMS Esk sank after hitting a mine off the Dutch coast on 1 September 1940. Bulwark’s Commanding Officer laid a wreath at the central monument in the cemetery, which was blanketed in snow, creating a wonderfully peaceful atmosphere for the solemn occasion. On a lighter note, Kiel was the first port of call for Bulwark’s unofficial mascot, a teddy bear donated by the people of her affiliated county of Durham when the ship visited last year. Very imaginatively named ‘Teddy’, the stuffed toy was given a tour of the port and posed with junior German officers. He’ll also be putting in an appearance at various other ports and locations as Bulwark continues her flagship duties. Next stop for Bulwark is the Polish port of Gdynia on the western shores of Gdansk Bay where she’s due to arrive on Friday for a four-day visit (weather and ice permitting) and will throw open her gangway this weekend for two days of tours for the Polish public. Bulwark’s using her journey around the Baltic to acclimatise to the cold. Next month the flagship leads British input to Exercise Cold Response, NATO’s winter war games in the fjords and valleys of northern Norway - where temperatures can drop to minus 30 degrees Celsius.